The Artful Baker: Extraordinary Desserts From an Obsessive Home Baker I'm delighted to introduce you to someone you will be so happy to know--my new kindred spirit: Cenk Sonmezsoy, (pronounced Jenk) from Turkey. You may be familiar with his blog Café Fernando, and that is how I first met him. What captured my attention several years ago, in one of those rare "why didn't I think of it" moments, was when I noticed a posting about how to line a round pan with a flat sheet of parchment. He simply crumpled the parchment and, of course, it readily conformed to the shape of the pan--brilliant--a man with imagination in his fingertips. Proof to me of our being on the same page: from the head note of Cenk's Double Chocolate Bundt Cake: "It's just my nature to continually retest until I've explored every nook and cranny, which sometimes results in my preferring a new version. I have yet to decide whether this compulsion is a blessing or curse, but knowing that I have done everything I can to perfect a recipe is the only way I find comfort and peace." I could have written this exactly the same way. In addition to being a skillfull technician of his trade, Cenk is an artist of exquisite taste, and an excellent and informative writer. His instructions are precise and complete. 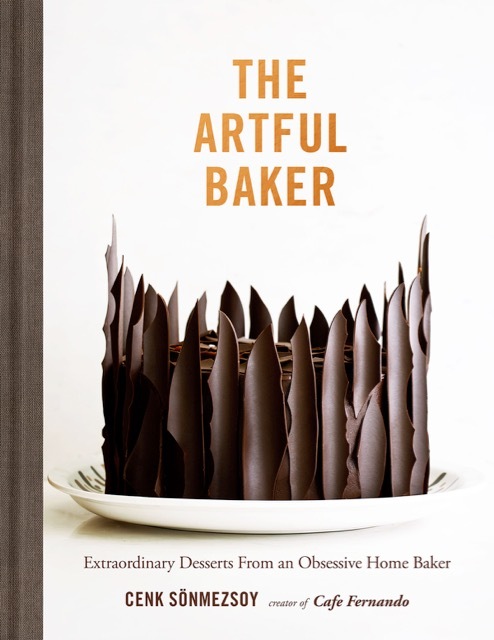 His book, appropriately titled The Artful Baker, is coffee table worthy, but you will want to bring it into the kitchen, cover the pages with a protective plastic sheet, and bake the hell out of it. 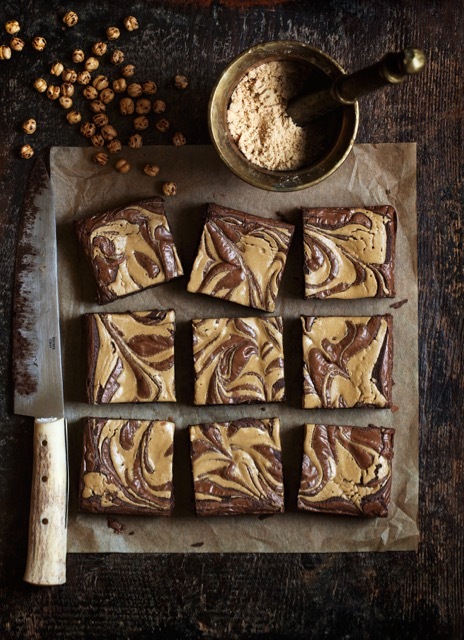 I've already made two recipes: the Sour Cherry & Almond Upside-Down Cake, because he said it's his favorite in the book, and the Tahini & Leblebi Swirl Brownies made with roasted chickpea flour and tahini, because the flavor combination so intrigued me, not to mention the stunning photo. We had many thought provoking email exchanges discussing, among other things, the comparative sourness of Turkish sour cherries to the American variety. I suspected that the American variety is more sour so I added extra sugar. The remaining cherry glaze was fantastic when drizzled onto vanilla ice cream. 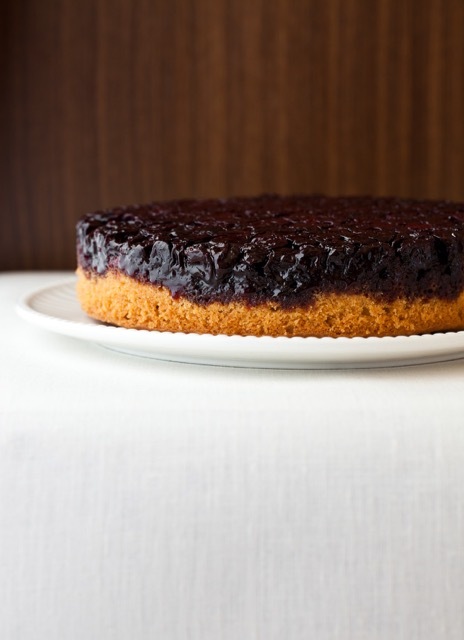 The almond cake is a high achievement in perfection of texture--surprising for a layer cake so low in wheat flour. The sour cherry topping for this upside down cake led to the following discussion about sweetness levels, and my impression that Turkish desserts can be cloyingly sweet. Cenk wrote: I also think that Turkish desserts are overly sweet and definitely share your sweetness sensibility. I'm always conscious about the amount of sugar I use in recipes, not from a caloric standpoint, but to achieve a balanced taste and optimal texture. That said, there are Turkish desserts (including some from the baklava family) that aren't overly sweet. Another example of Cenk's writing style and generosity of spirit: Have you tried brownies made with sarı leblebi (double-roasted hulled chickpeas) flour before? Sarı leblebi is a beloved Turkish snack, available at every kuruyemişçi (specialty shop selling dried nuts, seeds, and fruits), sometimes roasted right by the entrance to entice customers with its toasty smell. Roasting the chickpeas twice, chars them in spots, giving them an intensely toasty flavor. Sarı leblebi is available on line but you can substitute roasted chickpea flour (also called roasted gram flour or besan), found in Indian or Burmese food shops. Alternatively, you can roast regular chickpea flour in a cast-iron skillet over medium-low heat until it is lightly browned and smells nutty. And Cenk sent me a bag of both the sari leblebi and the chickpea flour through Amazon. The resulting brownies: chewy, fudgy, slightly cakey as well, with a dusky earthy quality underlying their chocolaty flavor. The first day they were a bit fragile, but after resting overnight, the texture became much firmer and fudgier, and the flavors were enhanced. 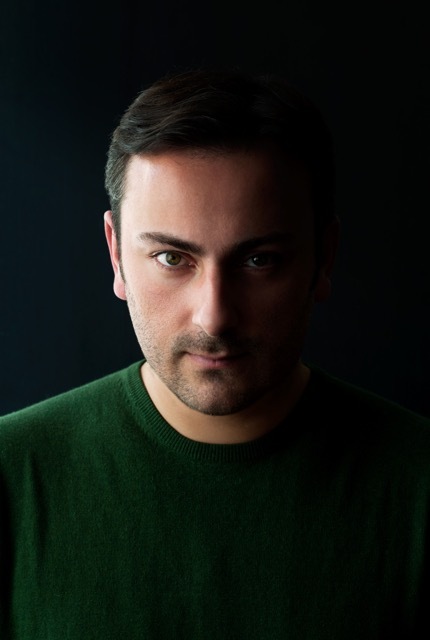 Cenk is one of the most original authors whose work I have ever encountered. 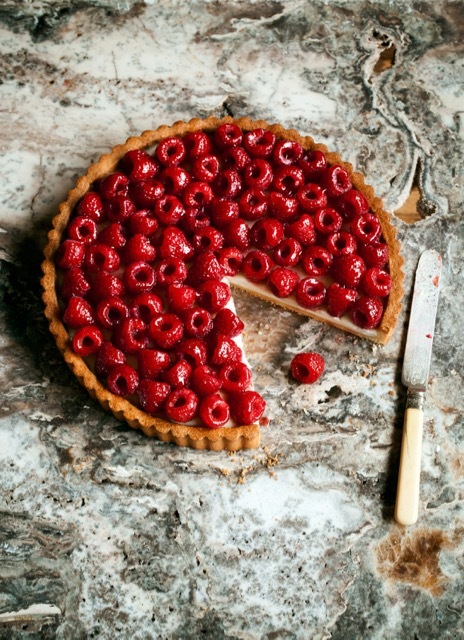 Even the way he places raspberries on a tart is unique I've never before seen them arranged open ends up and I love the effect. So it is all the more to his credit that to my delighted surprise I found myself listed in the acknowledgement page of his book as one of his "baking heroines." I love that Cenk shares so much in this book of his personal background, his thinking, his creative process. I have never met Cenk in person but I feel that through his work, I have a strong sense of who he is, and I am about to find out at his book party in NYC at ICE! He is on book tour this month of October around the US, and his schedule of events and appearances will be listed here on his blog. If youi're lucky, he may be coming to your city. Even if you never plan to bake a thing in your life, you will love having this book because it will give you a glimpse into a very special baker and his baking paradise.